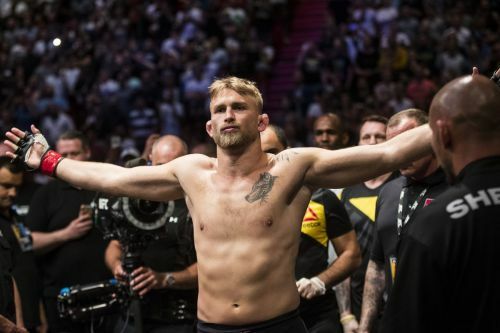 Top UFC light heavyweight contender, Alexander Gustafsson, has reacted to the recent drug test results of his UFC 232 main event counterpart, Jon Jones. UFC 232 has now shifted base from the T-Mobile Arena in Las Vegas to The Forum in Inglewood, California, as a result of Jon Jones' USADA screening, earlier this month. Alexander 'The Mauler' Gustafsson is a Swedish martial artist currently competing in the UFC's light heavyweight division. He is currently on a two-fight win streak with the UFC, with victories over the likes of Jan Blachowicz, and Glover Teixeira. The Swede is the closest to have come to beat Jon Jones in an MMA contest when the pair squared off against each other at UFC 165, way back on September 21st, 2013. Following his loss to Jones, Gustafsson suffered two more defeats against Anthony Johnson and Daniel Cormier at UFC on FOX and UFC 192, respectively. After a long five-year wait, Gustafsson finally managed to claim a rematch against Jones, on Jones' return to the Octagon, post a 15-month suspension from the UFC. While the news of Jon Jones' recent test results circulated amongst fight fans across the globe, Alexander Gustafsson was on a four-hour helicopter ride over and around the Grand Canyon. ESPN's Ariel Helwani was the first to bring this to the notice of fans that 'The Mauler' may very well be unaware of the situation regarding his upcoming fight at UFC 232. Alexander Gustafsson, who is scheduled to fight Jon Jones in 6 days, has been in Las Vegas for a week and, according to sources, is on a four-hour helicopter ride right now around the Grand Canyon. If he doesn’t have cell reception there is a very good chance he doesn’t know. Gustafsson soon learned about the situation at hand and went on to say the following in reaction to the matter. Jon Jones and Alexander Gustafsson will be locking horns in a highly-anticipated light heavyweight title fight on December 29th, 2018, at UFC 232. The venue for the event has been moved to The Forum in Inglewood, California, and ticket refunds from the T-Mobile Arena are expected to reach fans soon. Any early predictions for the main event title fight between Jones and Gustafsson? Leave us with your thoughts and opinions in the comments section below!